The State Fair of Texas is back! Big Tex has risen again, fancy cars are being polished, and food is being soaked in hot fat as we speak. Whether you go every year or this is your first visit, we have all the info you need to have a great time. The State Fair of Texas will be held at Fair Park in Dallas Sept. 29 through Oct. 22. Gates open at 7 a.m. (except opening day when they open at 10 a.m.) Exhibits and food concession stands are open 10 a.m. to 9 p.m. Sunday-Thursday and 10 a.m. to 10 p.m. on Fridays and Saturdays. Museum and Midway hours are different every day. Tickets can be bought online or at Kroger or Walgreens locations in DFW. Groups of 20 people or more can save up to 33 percent with advanced tickets. General admission is $18 at the gate and $16.50 online. Kids and seniors are $14 at the gate and $12.50 online. There are a lot of opportunities for discounted tickets. Click the link below to explore all the options. Parking at the fair is $15. If you live in North Texas, it's much easier to take the DART Green Line to two stations – Fair Park Station, located on Parry Avenue at the entrance to the fairgrounds, and MLK, Jr. Station, located south of R.B. Cullum Blvd. and convenient to the MLK fairground entrance (Gate 6.) Click here to view the State Fair DART schedule or click here to view the TRE schedules. If you are traveling from Denton County, take the A-train from one of five stations and transfer to DART’s Green Line at Trinity Mills. Click here for travel information. Please note: The A-train does not operate on Sunday. Live music lovers are in luck. While stages throughout the fair will be adorned with musicians at all hours, some big names are stepping up onto the Chevrolet Main Stage over the next month -- including Maren Morris, Flo Rida and Wilson Phillips. Besides the awesome cars on display and the outrageous food, there is always a ton of stuff to do. Don't miss the the Lone Star Stampede, light shows, acrobatics, pig races, the midway barker, and more. If you're looking for something a little more historic, "Texas in the First World War" provides an in-depth look at the role Texans played during this pivotal time in history. Your first stop when you get to the fair should always be Fletcher's Corny Dogs. After that you can take your obligatory selfie with Big Tex and go on your merry way, trying all the new fried food you can manage without falling over. 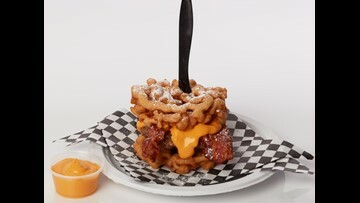 This year's Big Tex Choice Award winners are The Gulf Coast Fish Bowl for "Best Taste -- Sweet" while the Funnel Cake Bacon Queso Burger (pictured above) won for "Best Taste -- Savory" and the award for "Most Creative." And if those don't look appetizing to you, the State Fair is absolutely full of amazing items deep fried to your heart's content. Get a full look at all the food available by clicking here. WFAA will be out and about during the State Fair, so follow us on Facebook and Twitter, and share your fair photos with us using #ShareTheFair.